Ahoi es gibt schon nen kleinen Spoiler mit nen paar Bildern, also viel Spaß beim diskutieren. 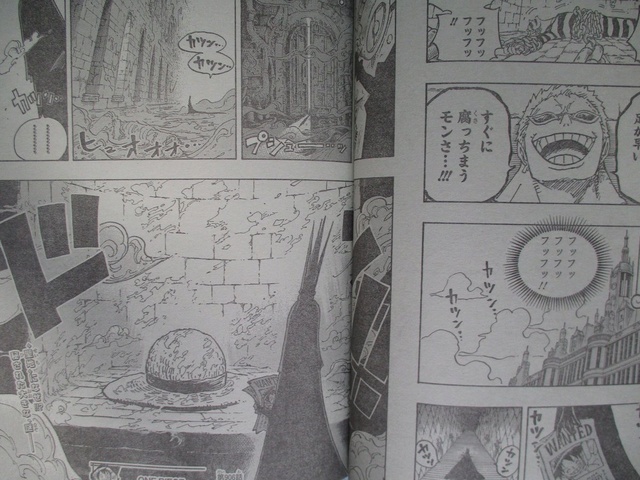 From the Celestial Dragons' estates Charloss sees Shirahoshi with a pair of binoculars and wants to get hold of her. The gates open and Ryugu/Goa kingdoms enter the venue but the other kingdoms are already there. 'You like him don't you' he says in a quiet voice. In Mariejoa, a straw hat is completed. I have no idea what's going on here, the provider implies that the Straw Hat was made by someone, but doesn't say who. Shirahoshi: Were you guys talking about Luffy sama by any chance just then? Manboshi: Whaddya doing talking to them? They're strangers! You can't say that we're friends with Luffy! He's a pirate! We'll be found out! 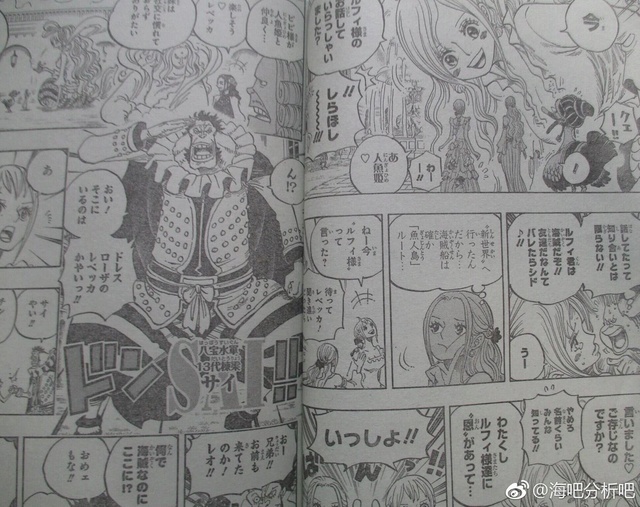 Vivi: So pirates really go through the Fishman Island route to get to the New World..
Rebecca: Hey did you just say 'Luffy sama'? S: Oh yes I said it <3 Do you know him? M: Stop!!! Everyone knows his name! S: I'm indebted to Luffy and his friends..
R & V: Me too!! Viola: Rebecca looks like she's having fun. Sai: Hm? Oi! I'm over here! You're Rebecca of Dressrosa aren't you! S: Oh! Brothers! You've come too Leo!
? : Why are pirates here!? Sh: What a beautiful place !! Is that green thing there a " forest" ? X : no , it is man-made .